Developments that could lead to a significant reduction in the cost of photonic integrated circuits lie behind the announcement of a series-A funding round for Dutch start-up Effect Photonics. The first close of the investment round – there is likely to be a second close soon - was led by Swiss investors b-to-v Partners, and included the Brabant Development Agency (BOM) and Optidob from the Netherlands. The amount was not disclosed. The funding will allow the company to move to the next stage of its growth, with product news expected in the autumn, according to CEO James Regan. “The announcement is really that Effect Photonics is here. We’re funded, we’re running, we’re ramping our headcount, we’re ramping up our facilities,” he said. Founded in 2010, Effect Photonics says it has optimised a process for building highly-integrated optical components at low cost. The company isn’t ready to give out product details, but says it is using an indium-phosphide-based optical chip to target DWDM applications on the edge of the network. 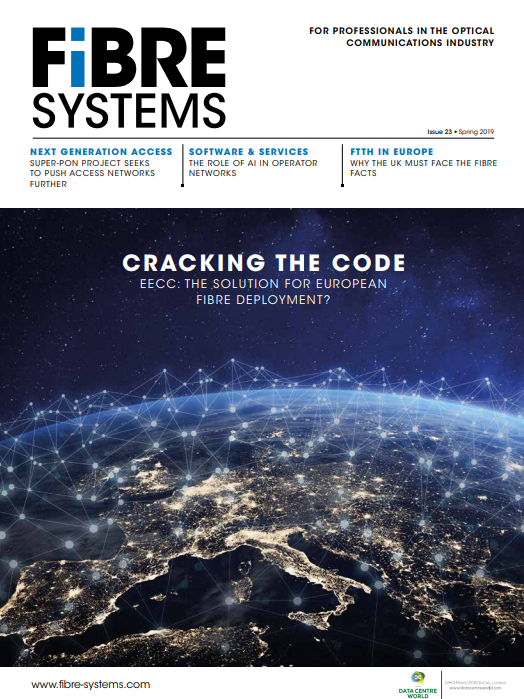 He points to the increasing use of DWDM in mobile fronthaul applications as well as in data centre optical interconnection and soon fibre-to-the-home (see Mobile fronthaul: a new optical opportunity). If Effect Photonics really can deliver highly-integrated components at low cost, then it will have achieved something exceptional. While a number of components and systems vendors have produced photonic integrated circuits, the process and products tend to be complicated to develop and therefore expensive – achieving only one out of the two aims. Effect Photonics is off to a good start, however. The start-up benefits from photonic integration research spanning more than a decade at one of Europe’s leading universities in the field. It is a spin-out from the Technical University of Eindhoven (TU/e), where Professor Meint Smit and his team have been developing what they call ‘generic integration’. Effect Photonics was co-founded by TU/e researcher Boudewijn Docter, now its chief technology officer, who for his PhD developed a fabrication process for those building blocks in indium phosphide: including active elements like lasers and amplifiers, passive elements like waveguides, as well as deeply-etched, broadband mirrors that can be placed anywhere in the circuit. The start-up has hired more people with photonic design and fabrication skills from TU/e, and set up a second facility in Torbay in the UK - home of the former Nortel Optical Components business and Bookham Technologies - where it can access optical packaging and commercial experience. Regan’s background was with Nortel for more than a decade, then Agility Communications and JDSU. Robert Hughes, Effect’s VP of sales and marketing is also ex-Nortel. Effect Photonics won’t make its own optical chips; not needing to build its own fabrication facility is an important part of the business model. Instead, it will design chips from standard, high-yield building blocks that are available at its partner optical foundries. The start-up didn’t want to reveal its foundry partners, but it’s worth noting that TU/e hosts the Joint European Platform for indium-phosphide-based Photonic Integrated Components (JePPIX), an organisation with a mission to improve access to advanced fabrication services for photonic integration. JePPIX coordinates multi-project wafer runs – allowing companies to share wafers and costs when prototyping their optical chips – as well as access to design tools and packaging technologies. One of the optical foundries coordinated by JePPIX is located in Eindhoven - Smart Photonics is another spin-out from TU/e, making optical chips based on the generic integration platform developed at the university. JePPIX also provides access to optical foundry services at Oclaro in the UK and HHI in Germany. Effect Photonics says has been working quietly over the last few years, getting its technology to the necessary level of maturity and working with customers to define what they need. Now that the funding is in place - both the series A investment and other, unspecified types of finance - the company intends to push through product development and into production.